Originally published on 3dPrint.com by EDDIE KRASSENSTEIN on November 19, 2014. You can view the original article here. With 3D printing comes the ability to create custom products in a very short amount of time. This is why some people believe that the technology will ultimately lead to a mass customization aspect within the manufacturing and design space. 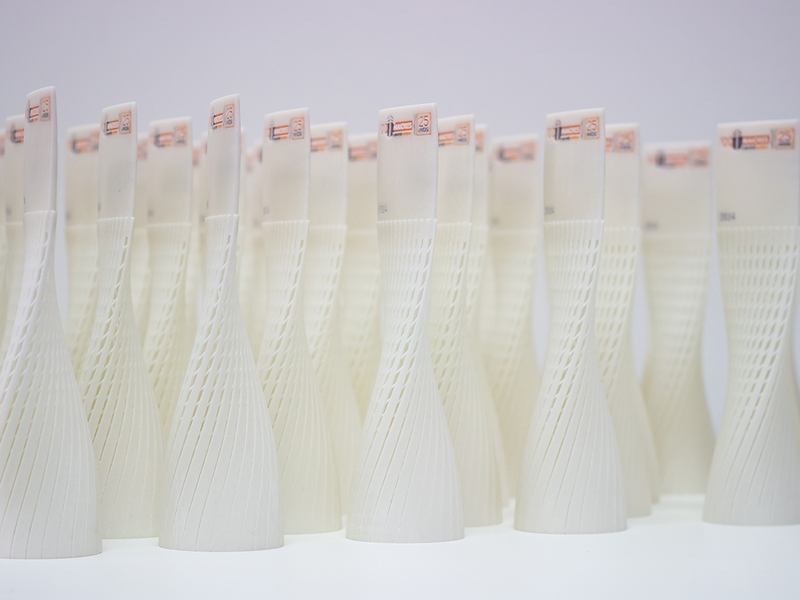 In the past, we have seen awards and trophies created through the use of 3D printing, quite simply because of this very customization aspect that the technology provides. No one wants a generic trophy that looks the same as every other award they have received, and more importantly companies don’t want to spend months or even years designing, developing, and manufacturing these awards. Recently, a company called NUUMstudio was contacted by a publishing company asking if they could help in the creation of some very special trophies. NUUMstudio is a small creative studio, founded by two architects, named Wojciech Hydzik and Claudia Barros Alves. Based in Funchal, a town on the Portuguese Island of Madeira, they recently just got into the business of 3D printing, aiming to produce and sell their own products via their son-to-be-released web shop, NUUMshop. 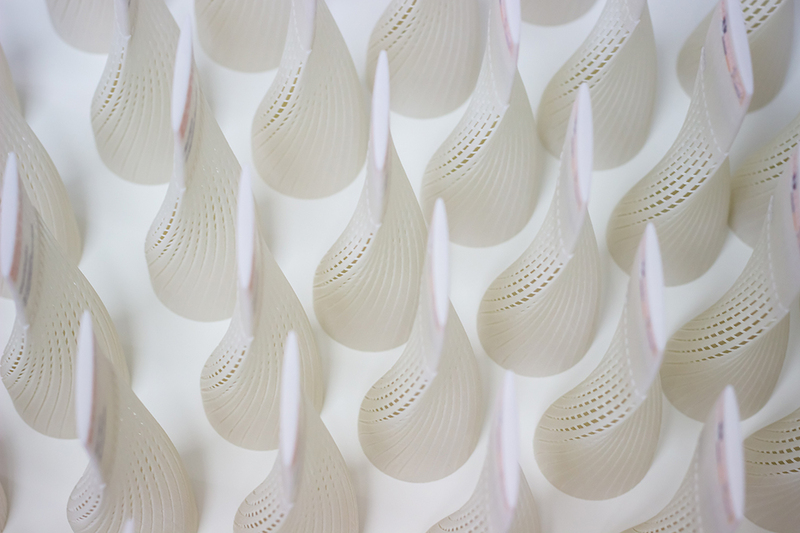 Using their design ability, which they learned from being architects in London for approximately 6 years, the team created the renderings of the trophies and then 3D printed them on their newly acquired 3D Systems Projet 4500. Now that this project has been complete, the team at NUUMstudio is focusing on designing their own 3D printed products, which they plan to sell both online and through several different retail shops. Their products will range from household items to personal accessories such as phone cases, jewelry, and more. They are also in discussions with local hotels in order to design personalized architectural models. What do you think about these incredibly unique 3D printed trophies? 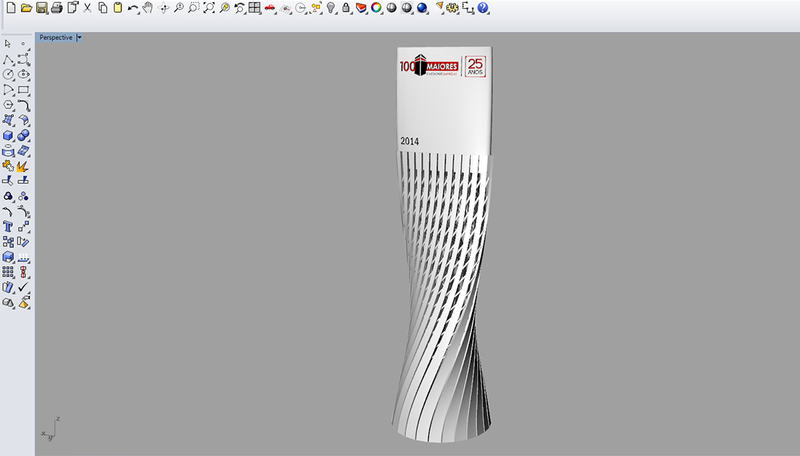 Discuss in the 3D Printed Portuguese Trophies forum thread on 3DPB.com. 3D Systems(NYSE:DDD) today announced it will preview its fastest fab-grade Selective Laser Sintering (SLS) system yet, the ProX 500 Plus, at EuroMold 2014 in Frankfurt, Germany. Building upon last year’s successful ProX 500 release, the ProX 500 Plus continues the company’s efforts to redefine production 3D printing, adding upgraded speeds, higher print resolution and an expanded range of engineered composite materials to the line’s already stellar part quality, precision and durability. Like the ProX 500, the ProX 500 Plus delivers injection molding-grade parts without expensive fixed tooling for highly complex and mass customized production. Parts from ProX-series SLS printers exhibit long-lasting, fab-grade durability and functionality as well as smooth surface finish. With the elevated production capabilities and repeatable results of the ProX 500 and ProX 500 Plus, service bureaus and large manufacturing operations—in industries like aerospace, automotive, electronics, customized medical devices, consumer products and rapid tooling—can rethink entire production and supply chain strategies for advanced product performance and lower total manufacturing costs. In addition to high material recyclability, the ProX 500 Plus allows for greater flexibility, so companies can explore localized manufacturing for step-change ability to exploit evolving marketplace opportunities and gain first-mover advantage. DuraForm ProX GF is a glass-filled polyamide (Nylon) material formulated for maximum stiffness and elevated temperature resistance. For parts that will undergo thermal stress or those that require high rigidity—like aircraft and automotive parts, complex housings and enclosures—DuraForm ProX GF will be the go-to material. DuraForm ProX AF+ material is an aluminum-filled polyamide (Nylon) with a gray appearance, high strength-to-weight ratio, elevated thermal resistance and improved machinability. This material is perfect for manifolds and similar under-hood automotive models in addition to jigs and fixtures—any end-use or working prototypes with a cast aluminum aesthetic for engine and other equipment components requiring high force loading. DuraForm ProX EX is a high impact strength nylon material with increased durability and remarkable flexibility. DuraForm ProX EX will be ideal for applications with high-force snap-fit designs, thin-walled parts and other fine-featured models needing nearly indestructible toughness and durability. The ProX 500 Plus’ new high-resolution mode prints part features down to as small as .45mm and boasts higher part density, tensile strength and modulus stiffness. In terms of print speed, the ProX 500 Plus offers 30% faster printing in high-speed mode. For over 20 years, 3DS has set the standard for SLS 3D printing, proving its parts in prototyping, rapid tooling, end-use and functional testing applications in demanding applications around the world. Today its SLS printers set the industry’s benchmark for production-grade manufacturing in aerospace, automotive, electronics, medical devices, fashion, consumer products and more. 3DS is exhibiting the ProX 500 Plus and revealing its new materials portfolio at EuroMold 2014 in Frankfurt, Germany from November 25-28, 2014, at the Messe Frankfurt in booths D69 and F90 in hall 11, along with its latest 3D printers, advanced material options, cloud-sourced custom parts and digital thread of 3D capture, creation, print and inspection tools. Expected availability for the ProX 500 Plus is early 2015, and an upgrade kit will be available for existing ProX 500 customers at time of launch. Watch a video of this new production SLS printer here. 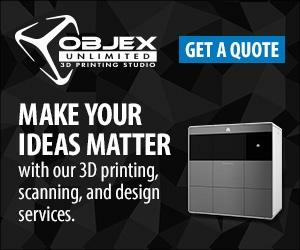 Listen to Objex Unlimited President, Steve Cory, talk 3D Printing on “The Voice Of Entrepreneurs” Radio Show! President and Founder of Objex Unlimited, Steve Cory, was recently featured on “The Voice of Entrepreneurship” Radio Show. Listen below to hear about, 3D Printing, Entrepreneurship, and the humble beginnings of Objex Unlimited. Where the world of 3D Printing is right now. Some myths and misconceptions of 3D Printing. 3D Scanning, 3D Design, and Rapid Prototyping services. Entrepreneurship, staying focused and building a business. The growth of Objex Unlimited as a 3D Printing Studio. Prototypes, 3D art, Sculpted Portraits (Sculptraits), and even 3D printed pets! “The Voice of Entrepreneurs is an entertaining weekly business, entrepreneurial, and educational program that takes you on an energizing and effective ride into the real and authentic challenges faced by all of us in business today. We interview business owners and experts, and tackle meaningful issues that will impact your bottom line. Hosted by Mark Garrett, with his trademark enthusiasm and empathy for his clients, and Cathy Pettigrew, who brings a wealth of practical entrepreneurial experience “from the trenches” – and who is now intent on keeping Mark on his toes – you are in for an entertaining hour of information and learning! The Voice of Entrepreneurs covers all elements of business, from sales and marketing to accounting, HR to legal issues, social media to risk mitigation. We explore the areas that are so important to every business – big and small – and stitch together unique ideas, and tried & tested best practices, into practical applications that will bring you success in your business. Join Mark and Cathy each week, as they bring together a successful business owner and an industry expert to discuss specific business topics and deliver actionable results that you can implement immediately, to see results quickly. https://objexunlimited.com/objexunlimited/wp-content/uploads/2014/11/Ad-Card-2-386x345.jpg 345 386 Objex Unlimited https://objexunlimited.com/objexunlimited/wp-content/uploads/2017/11/OBJEX_LOGO_WHITE_17-copy.png Objex Unlimited2014-11-25 16:40:512015-03-11 14:26:02Listen to Objex Unlimited President, Steve Cory, talk 3D Printing on "The Voice Of Entrepreneurs" Radio Show! 3D Systems (NYSE:DDD) today announced it will offer a preview of its latest industrial Direct Metal Printing (DMP) system, the ProXTM 400, at EuroMold 2014 in Frankfurt, Germany. The ProX 400 gives aerospace and automotive companies, medical implant makers, tool & die makers and service bureaus the power to print high-quality, end-use metal parts faster and more economically than traditional processes allow. For parts up to 500 X 500 X 500 mm3, the ProX 400 produces strong, fully dense metals and exceptional surface finish, and it does so without the complexity of multi-step machining or the time and expense of tooling. The ProX 400 sets the standard for high-capacity metal 3D printing, producing precise parts in a multitude of alloys. ROCK HILL, South Carolina, November 17, 2014 – 3D Systems (NYSE:DDD) today announced the advancement of 3DPRINTING 2.0 with several next generation printers, advanced material options and additions to its design-to-manufacturing digital thread that will accelerate the ability to manufacture the future NOW. The company will reveal these new solutions throughout the week and showcase its full power of 3DPRINTING 2.0 at EuroMold 2014 in Frankfurt, Germany from November 25-28, 2014 at the Messe Frankfurt in booths D69 and F90 in hall 11. 3DS plans to showcase its latest capabilities, including new products that build on its leading technology in Direct Metal Printing (DMP), Stereolithography (SLA®) and Selective Laser Sintering (SLS®), together with new advanced materials that open entirely new applications. The company also plans to debut a new suite of 3D software and scanning solutions that substantially enhance its design-to-manufacturing digital thread, providing users with expanded capabilities and simple-to-use tools. Largest metal parts printing with factory production features – 3DS will preview the latest addition to its ProXTM Direct Metal Printing (DMP) line, the ProX 400, with the largest build size of any metal 3D printer and factory production features including automated finishing and a modular design. This printer will feature 3DS’ class-leading accuracy and surface quality, with high-quality, fully dense metal parts for demanding high-capacity industrial applications. Next generation fab-grade Stereolithograhy (SLA®) – The ProX 800 builds on the accuracy, reliability and precision of 3DS’ industry-leading Stereolithography(SLA®) technology, with new features for greater production efficiency, including revolutionary print head and material management systems, space-saving footprint and easy-to-use operator controls. Its exceptional build volume and speed are ideal for automotive, aerospace, medical device manufacturing and 3D printing service bureaus. Groundbreaking Selective Laser Sintering (SLS®) with an expanded material set – 3DS will preview the ProX 500 Plus, which builds on the ProX 500’s superior part quality, precision and durability with an expanded range of new materials, faster print speeds and a higher resolution setting. New glass-filled, aluminum-filled and nylon materials enhance the production application sets of this production workhorse. New materials and applications in Micro-SLA printing – 3DS is announcing five new materials for its ProJet® 1200 Micro-SLA 3D printer that will expand applications for dental labs, jewelers, manufacturers, engineers and 3D artists. New FTX Cast and FTX Gold and FTX Silver give jewelers a complete digital prototyping and production workflow, and new FTX Gray and FTX Clear add to the complete portfolio of material options for small end-use parts and presentation models for engineers and figurines and design creation for 3D artists. Advanced composites and flexible materials for MultiJet printing – New materials for the ProJet 5500X offer new levels of versatility for models, functional prototypes and end-use parts, with tough, functional-grade, flexible elastomers in black and translucent. Combining the new materials with the VisiJet® white and clear ABS-like plastic print materials, the ProJet 5500X can create up to 14 unique materials in a single print. Scan-based design and inspection system for small, precise parts – The Capture® Mini is based on the previously released Capture system and designed specifically for small, precise parts scanning and inspection. Perfect for small mechanical parts, jewelry and dental models, the Capture Mini and Geomagic® software provide a complete digital thread for capture, creation, print and inspection workflows. Empowering the design-to-manufacturing digital thread –3DS will showcase a cloud and desktop-based app that manages the design-to-manufacturing digital thread in a seamless user experience, whether at the print device level, or extending to the cloud for printing, collaboration and file sharing anywhere at any time, with easy access to 3DS’ on-demand parts service, Quickparts®. 3DMe® scanning and printing experience comes to the retail and event space – 3DS will showcase its 3DMe® Photobooth, a compact 3D scanning kiosk with an integrated 3DMe figurine app along with ecommerce and fulfillment. With an easy, self-guided interface, instant face capture and small footprint, it’s perfect for retailers and event venues to bring the 3DMe experience to their space. Join 3DS’ President and CEO, Avi Reichental, for a broadcast of 3DS’ extensive showing at EuroMold by visiting http://www.3dsystems.com/resources/press-room/euromold-2014 and clicking on the broadcast link starting at 10:00 a.m. EST on Tuesday, November 25, 2014. Find out more about EuroMold 2014 at www.euromold.com and learn about 3DS’ commitment to manufacturing the future at www.3dsystems.com.